San Diego and Imperial Counties in California Farmer's Markets: Find a local farmer's market near you in San Diego and Imperial Counties in California for fruit, vegetables, pumpkins, organic foods,local produce and more! 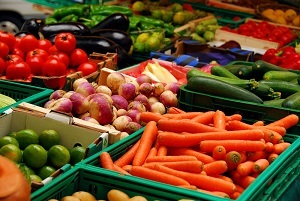 Looking for a local, true farmer's market in San Diego and Imperial Counties in California? 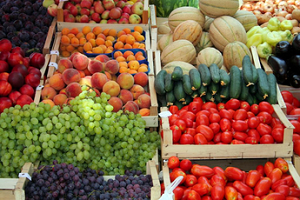 Scroll down this page and you will see the farm markets, farm stands, roadside stands, produce markets, even garden fruit and vegetable stands and seasonal community farmer's markets in San Diego and Imperial Counties in California, sorted by county. Markets offering organic or sustainably grown produce are identified by the words "organic" and/or "sustainable" in Green, next to their name. If they have a website, the name will be in blue and underlined; click on it and it will open their website. 15954 Woods Valley Road, Valley Center, CA 92082. Phone:800-642-0348. Phone: 760-749-3333. Fax: 760-749-9939. Email: info@batesnutfarm.biz. Open: Monday to Friday, from 9:00 to 5:30; "Friday Nights at the Farm" extended hours on 10/10 and 10/17 until 8:00 pm Saturday and Sunday 8:38 am to 6:00, September 25 pm to October 31. Click here for current open hours, days and dates. Directions: Click here for a map and directions. Pumpkin Patch open daily from September 25 to October 31; The farm is open year round. Payment: Cash, Check, Debit cards, Visa/MasterCard, Discover. Click here for our Facebook page. Special events, live entertainment, food trucks and family fun take place throughout the season. Visit our website for all event listings. Bates Nut Farm started with walnuts, but now purchases nuts from all over the world. Pistachios, pecans, cashews, peanuts, pignolias, sunflower seeds and much more can be purchased on the farm. The nuts come raw, roasted, some spiced up and unsalted. 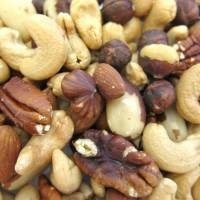 To ensure quality and freshness we roast and package our nuts on the farm. The Bates family takes pride in providing a quality product at a fair price. It’s part of the tradition. One reader reports: "This is the best place to go for pick your own pumpkins. They have everything you could want from Big Macs (100+ pound pumpkins) to small decorative gourds, hay bales and corn stalks are also for sale. Year round, they have a wonderful store filled with nuts, candies and cute hand made items and small animals for the kids to feed. During pumpkin season they have a hay maze, pony rides, petting zoo, tractor rides, face painting, bounce houses, many, many activities. And the first 2 weekends in October they have an arts and crafts festival that is enormous. This is truly the most fun family outing!! I go there every year with my kids! Please add!" Another visitor writes: (October 18, 2005): "I just wanted to RAVE about the fun my family had at the Bates Nut Farm Pumpkin Festival. There were so many activities, food was great and the pumpkins, WOW, so many to choose from. I have a 3 year old son and he did not want to come home, we will definitely return next year. Thanks for taking the time to have this website available to people. It helped us." Canyon Crest Academy, 5951 Village Center Loop, San Diego, CA 92130. Phone: (858) 945-5560. Email: carmelvalleyfarmersmarket@gmail.com. Open: Thursday: 2:30 pm to 7 pm. Upper Shores Park- 225 9th Street, Del Mar 92014. Phone: (760)453-9837. Email: fabianhuertas@outlook.com. Open: Saturday: 1 - 4 pm. North Park Way and 30th st, San Diego, California 92104. Phone: (619) 233-3769. Email: info@sdweeklymarkets.com. Open: Thursday: 3 pm to 7 pm. Accepts EBT. 1655 Euclid Ave., San Diego 92105. Phone: (619) 813-9148. Email: Diane@ProjectNewVillage.org. Open: Wednesday: 5 pm to 8:00 pm. Innovations Academy, 10380 Spring Canyon Rd (corner of Scripps Poway Pkwy), San Diego, CA 92131. Phone: (858)-586-7933. Email: srfarmersmarket@aol.com. Open: Saturday: 9:00 am to 1:30 pm. Corner of Mast and Carlton Hills Blvd, Santee, CA 92071. Open: Wednesday: 3:00 pm to 7:00 pm; Winter Hours 3:00 pm to 6:00 pm (Nov-Feb).Phone: (619)-449-8427. Email: santeecertifiedfarmersmarket@gmail.com. Accepts EBT, Credit & Debit.